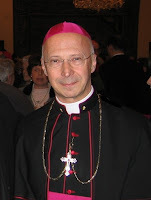 LifeSite news reports that Archbishop Angelo Bagnasco has received another little present in the post. Three bullets this time, from an anonymous homosexual activist furious at Bagnasco's public stand against homosexual civil partnerships. An Eastern European Bishop commenting on his own experience once said that it would be good for any Bishop to spend some time in prison for the faith. Getting bullets sent to you in the post is another good indicator that you are doing your job.